In the year 1296, Uilliam Liath De Burgo started to build a monastery for the Franciscans on a site roughly where the Courthouse is today. It became known as “St Francis’ Abbey on the island of Saint Stephen on the north side of the town”. The island was formed by the river on the west side, and by a branch of the river running through what is Woodquay and Mary Street today, to join the main stream above O’Brien’s Bridge. A second and smaller island lay between St Stephen’s and the town wall, so in order to communicate with the town, two bridges were necessary, one at the junction of Mary Street and Abbeygate Street and the other at the Little Gate. The friars (“we don’t regard ourselves a priests but as friars, while some of us are priests, we are a brotherhood as distinct from being brothers” ) moved in to their new home in 1297 and it quickly developed a reputation as an important place of learning. It was not suppressed during the reign of Henry VIII, but it was in the year 1550 and the friars went into hiding. In 1559, a lease of the Abbey and all its belongings was made to the mayor and citizens of Galway but they never took possession, and the friars were back in 1569. In the 17th century, the building was granted to Sir George Carew for his services in defeating the Irish in Kinsale. On the 1651 map of Galway the Franciscan residence is located near the corner of High Street and Cross Street. In Cromwell’s time their buildings were destroyed and the church later became a courthouse. When the English monarchy was restored, the persecution ended and the Franciscans found a new home. Their chapel was a small thatched building. Their present residence was built in 1820 and their church, as we know it today, was finished in 1836/37. It was consecrated in 1849 and though it was called after St Francis, it is known to Galwegians only as ‘The Abbey’. The rapid expansion of the Irish Franciscan Province in the 1920s caused them to make better arrangements for students and they laid the foundation stone for St Anthony’s College in 1933. They expanded it in 1941 to cater for the ‘student explosion’ caused by the closure of their college in Louvain and the impossibility of sending students to Rome during the war. In 1971, Bishop Michael Browne made the Abbey a parish church. 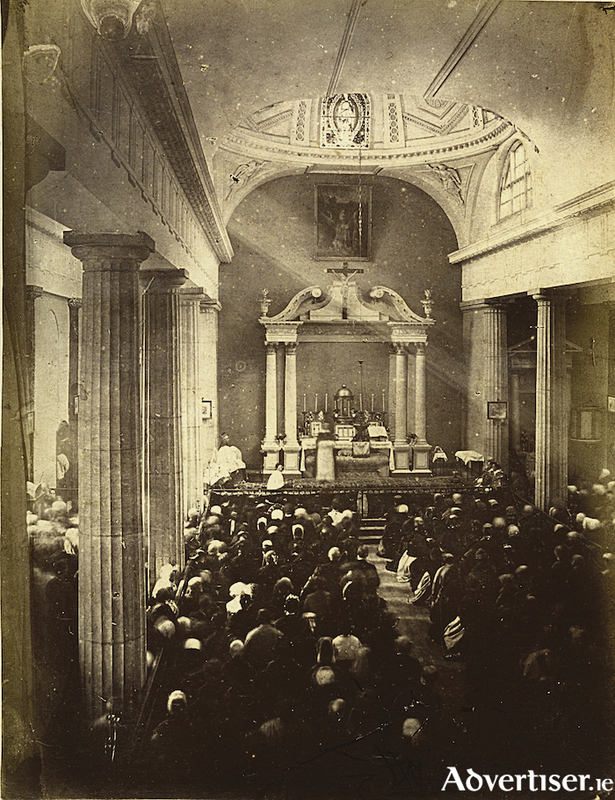 Our photograph of the interior was originally taken c1865 and shows a large crowd at Mass. It was kindly given to us by Chetham Library in Manchester.